The reelection campaign of Gov. Peter Shumlin has added a lengthy disclaimer to its emails in response to claims it illegally solicited money from registered lobbyists during the legislative biennium. The disclaimer first appeared last week at the bottom of an email titled “Getting Tough Things Done,” which touted three of the governor’s legislative accomplishments, including progress in reforming the state’s health care system. The warning is sandwiched between Shumlin’s signature and a giant “DONATE” button. You’ve heard the phrase “burn after reading,” right? No word yet on whether any lobbyists received this latest Shumlin solicitation. Jesse Bragg, the Vermont Democratic Party’s executive director, said the Shumlin email list has been scrubbed of all known lobbyists. Shumlin has said he will not accept money from any lobbyist who responds to one of his campaign emails, even though Shumlin continues to — wink, wink — claim there really isn’t a reelection campaign going on. Tell that to the folks shelling out big bucks to attend an in-state Shumlin fundraiser hosted by environmentalist and Democratic donor Crea Lintilhac on Thursday night. Vermont law forbids lawmakers and the governor from soliciting and accepting money from lobbyists, or their employers, during the legislative biennium. State law does allow Shumlin to accept donations from lobbyists as long as they are unsolicited — a caveat that doesn’t apply to lawmakers. Earlier this year, an unknown number of lobbyists received two separate fundraising emails issued by Shumlin’s campaign. That prompted Vermont Republican chairwoman Pat McDonald to file a complaint with Attorney General Bill Sorrell, a Democrat, to investigate whether Shumlin violated the law in doing so. Within days of McDonald’s complaint, the Vermont Democrats filed a similar complaint about former Republican Gov. Jim Douglas, who solicited lobbyists via snail mail during the 2009 legislative session. Deputy Attorney General Mike McShane tells “Fair Game” that the AG’s office received the complaints, but wouldn’t say how long the office will take to investigate the concerns. For her part, McDonald told “Fair Game” she’s happy the governor’s campaign staff put the disclaimer in the email. Secretary of State Jim Condos, a Democrat, agrees with McDonald that the “do not read” line might be better placed at the beginning of the letter — or struck entirely. Perhaps Lt. Gov. Phil Scott should take note. On April 25 — the same day that McDonald sounded the alarm about Shumlin’s emails — Scott sent out a letter on campaign letterhead inviting people, including lobbyists, to a special event at the Wayside Restaurant in Berlin. Scott, too, had a disclaimer at the bottom of the letter noting that Vermont law prohibited him from accepting contributions at the event because the legislature was still in session. He neglected to note that he can’t solicit money, either. And once Shumlin’s letter became a news item, Scott took a closer look at his own mailing list and determined — lo and behold — his was also sent to lobbyists. Whoops! So he issued a second letter informing folks that this was not a campaign event and to ignore the previous missive. “We shouldn’t have sent it,” said Scott. The irony, of course, is that Scott’s campaign manager last year was … Pat McDonald. Small state, eh? Condos said he’s not sure why so many Vermont pols are running afoul of the law. Historically, the AG’s office hasn’t fined in-state campaigns for violations. Maybe more memories would be jogged if it did. Gov. Peter Shumlin isn’t just sending emails about his legislative victories. He’s putting a lot of miles on the gubernatorial cruiser, making personal appearances all across the state. His victory tour caught Vermont Republicans flat-footed — until House Minority Leader Don Turner (R-Milton) called a Monday press conference to announce the GOP response. Legislative Republicans plan to launch a statewide tour this summer to drum up public support for their own budget-cutting ideas. As a bonus they hope to inspire a new crop of candidates to run in 2012, in an effort to chip away at the super majority currently enjoyed by legislative Democrats. Lt. Gov. Phil Scott, a fellow Republican, hosted the Republican Party-sponsored presser in his Statehouse office. He and other GOP leaders dissed Dems for their reliance on raising taxes and shifting general-fund dollars away from the education fund and increasing the statewide property tax by a penny — moves they warn could lead to property-tax increases down the road. 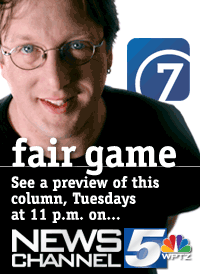 As “Fair Game” noted last week, Scott doesn’t see his role as the GOP voice of opposition. On Monday, Scott told reporters that, despite his public silence, in cabinet meetings he regularly spoke out against health care reform and medical marijuana dispensaries. But Scott said he agrees with Shumlin on many issues, especially the gov’s opposition to raising income taxes. “When I hear about the possible increase in the income tax or increase in the sugar tax or other consumption taxes, I think it’s a dangerous path to go down,” said Scott. Scott said he would do all he could to help the GOP recruit candidates to run for office, adding that he believes one-party rule isn’t good for government — no matter which political party is in charge. One party has pretty much been the “rule,” not the exception, in Vermont. According to State Archivist Gregory Sanford, a single political party has ruled both the legislative and executive branches 128 times since 1854. Since 1963, when a Democrat was elected governor for the first time in more than a century, Republicans have controlled both chambers and the governor’s office 12 times; the Democrats, seven. A new name has emerged as a possible candidate in the 2012 Burlington mayor’s race: Chittenden County State’s Attorney T.J. Donovan. Donovan isn’t the source of the rumors; rather, it’s a group of Democrats who are anxious to find a candidate who can recapture the mayor’s office after almost 30 years of Progressive rule. Donovan, a hometown boy, is respected across the political spectrum. Democratic Reps. Mark Larson and Jason Lorber are exploring mayoral bids, as is Councilor Joan Shannon (D-Ward 5). Though Donovan has statewide political ambitions — he’s toyed with runs for lieutenant governor and attorney general — being the mayor of Burlington would give him decent exposure in the state’s largest media market. It certainly worked out well for former mayor and now U.S. Sen. Bernie Sanders. If Donovan enters the race, he’d likely knock out all the other Dems and possibly Republican Kurt Wright, too. Donovan’s tough-on-crime reputation would likely take votes away from Wright. Progressive Mayor Bob Kiss still hasn’t said he won’t run. And if he does, he’ll likely have to survive a caucus challenge. City Progs expect to pick their mayoral and city council candidates by early fall. Donovan’s chances will have a lot to do with how the public responds to the results of his long-awaited criminal probe of Burlington Telecom. With or without indictments, Donovan’s digging is believed to have forced the resignation of Chief Administrative Officer Jonathan Leopold. The “man behind the curtain” is resigning at the end of June. It’s no secret the Burlington Free Press has it in for Mayor Bob Kiss. As “Fair Game” has noted, the Freeps tends to write about Kiss only when it’s bad news and ignores the mayor when he’s calling attention to some city success. Now City Progressive Party Chairwoman Abby Russell is intimating — in an op-ed on VTDigger.org — that the city’s paper of record is refusing to publish her “My Turn” op-ed defending Progressive management of city hall and many city programs. Russell penned the “My Turn” in response to an op-ed by Rep. Jason Lorber, in which he called on voters to “clean house” in the next mayoral election. She submitted the piece three weeks ago. No word yet from the Freeps on whether it plans to run Russell’s op-ed. If it’s anything like her Digger piece, the Burlington daily should have no problem slapping it on the page. While Russell lauds a variety of Progressive-led programs, she never mentions Kiss by name.